It’s been awhile since I’ve added new cupcakes to this site. 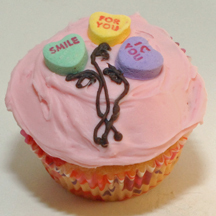 As a test, I’m reposting a favorite Valentine’s Day cupcake recipe. I hope you like this cute butterfly made with a yogurt-covered pretzel! What You Need: 1 cupcake; pink frosting (use strawberry, or tint your own); 2 chocolate-covered pretzels in white, red or pink; black writing icing. How to Make It: Frost cupcake pink. Position pretzels like butterfly wings. Use black icing to “draw” antennae between the wings. A medium-sized star tip is the trick to these pink Valentine’s Day cupcakes, which have a heart perched on the top of each start. What You Need: 1 cupcake; pink frosting; candy heart sprinkles; pastry bag and metal star tip (I used #21) or use tubed icing. How to Make It: Use star tip to make pink stars all over top of cupcake. Carefully place a colored candy heart on top of each star. What You Need: 1 cupcake; chocolate frosting; pink frosting; pastry bag and round metal tip (I used #4); pink conversation heart. How to Make It: Frost cupcake with chocolate. 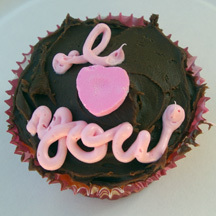 Write “I” and “You” using pink frosting, being sure to leave room for the heart. Place heart upside-down in gap. When someone gave me these white chocolate-covered pretzels at a party last weekend, my first thought was, “Yeah! Cupcakes!” Chocolate pretzels make great butterflies any time of the year. What You Need: 1 cupcake; pink frosting (I used strawberry flavored in a can); 2 chocolate-covered pretzels in Valentine colors; black writing icing. Spice up Valentine cupcakes by simply arranging red hot candies in the shape of a heart. 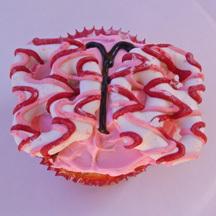 What You Need: 1 cupcake; frosting tinted pink; red hots (cinnamon imperials). How to Make It: Frost cupcake. 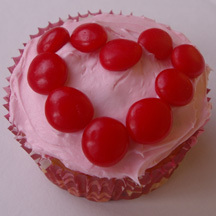 Place red hots on cupcake in a heart shape. 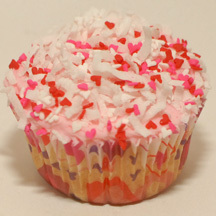 Jazz up simple cupcakes by adding Valentine’s Day sprinkles to coconut! The combination makes for an attractive cupcake with taste and texture. What You Need: 1 cupcake; pink frosting (I used Pillsbury’s canned Valentine’s Day frosting and it came with sprinkles in the lid); shredded coconut. How to Make It: Frost cupcake. Sprinkle with coconut. Add Valentine sprinkles. These conversation heart cupcakes are incredibly fast to make, and depending on which heart messages you choose, can be customized for kids, sweethearts or anyone on Valentine’s Day! What You Need: 1 cupcake; pink frosting; 3 conversation hearts; chocolate icing in a tube, or use a pasty bag and metal tip #1. How to Make It: Frost cupcake. 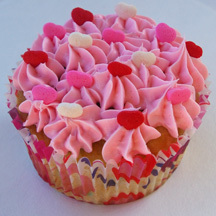 Arrange 3 hearts near top of cupcake. Use chocolate icing to “draw” balloon strings.